A mature “baldie” hangs out in the tree top . . . .
January 10 is the official day to count bald eagles, America’s national bird. We had such a great time last year, we volunteered to do it again. We left at daybreak to cover our assigned routes from Kaycee to Mayoworth, across the mesa, along Greub Road to Trabing Road and old U. S. 87 to I-25. 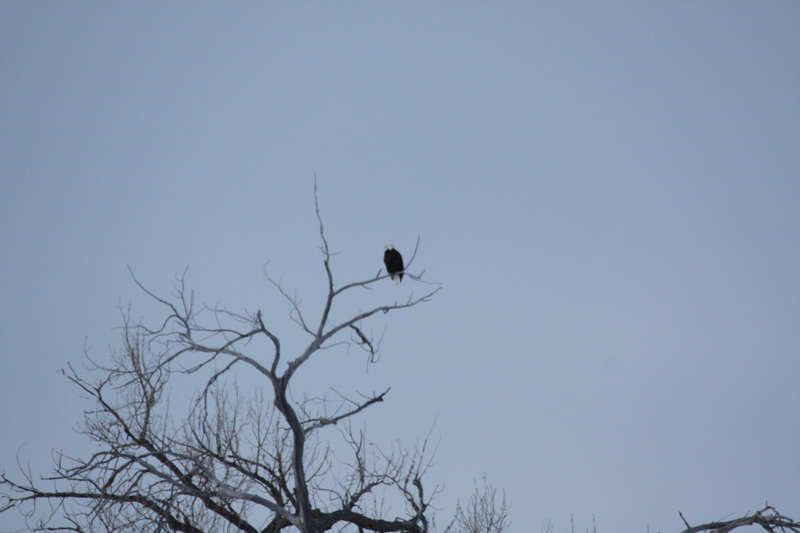 We sighted over a dozen eagles, including a number of golden eagles, which are my favorite. “Too close for comfort!” . . . . 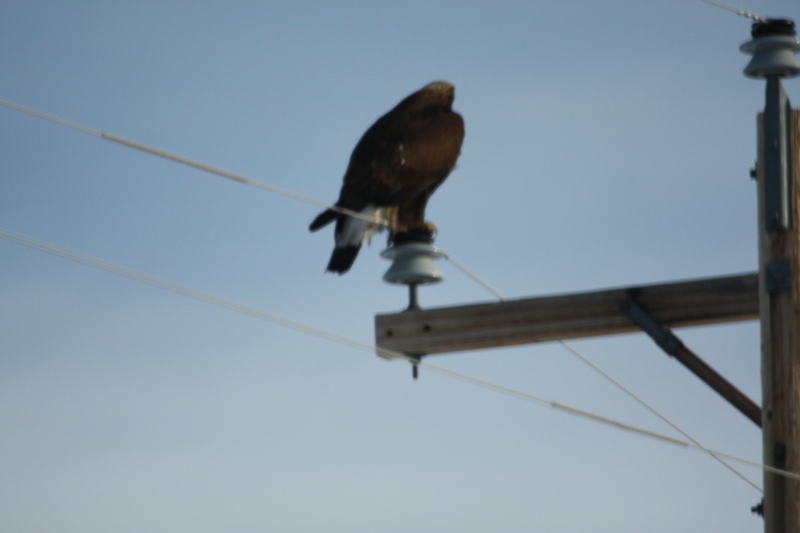 This beautiful creature was sitting on a telephone pole until we came too close and he took off in flight. They are amazing to watch and I had to grab a hurried shot as he departed. 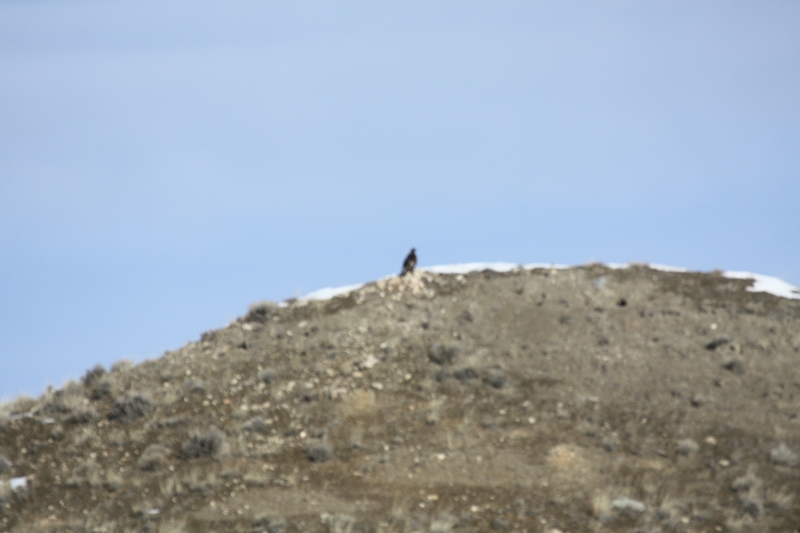 This is a mature golden eagle and our closest encounter of the day. 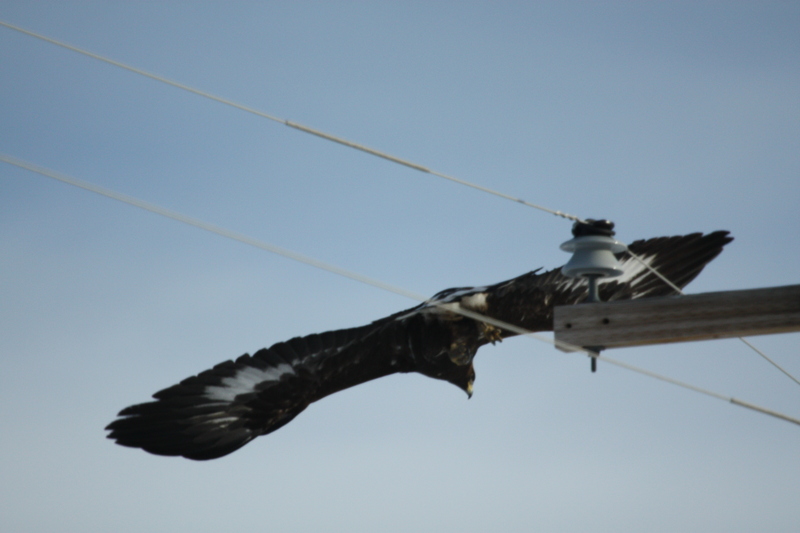 A juvenile bald eagle? . . . . This eagle had what looked like a growth of light-colored feathers around his crown, which would indicate he was an immature bald eagle. As it turns out what we saw was a wash of gold around the crown of a young golden eagle. This majestic bird has a wing spread of about 7 feet and in flight is readily identified by the white flash in the wings and tail mottled with white at the base. oops. Immature golden? . . . .
Making a positive identification is somewhat difficult, as these birds are on the move. We also sighted some hawks, lots of deer, antelope and a rooster pheasant. 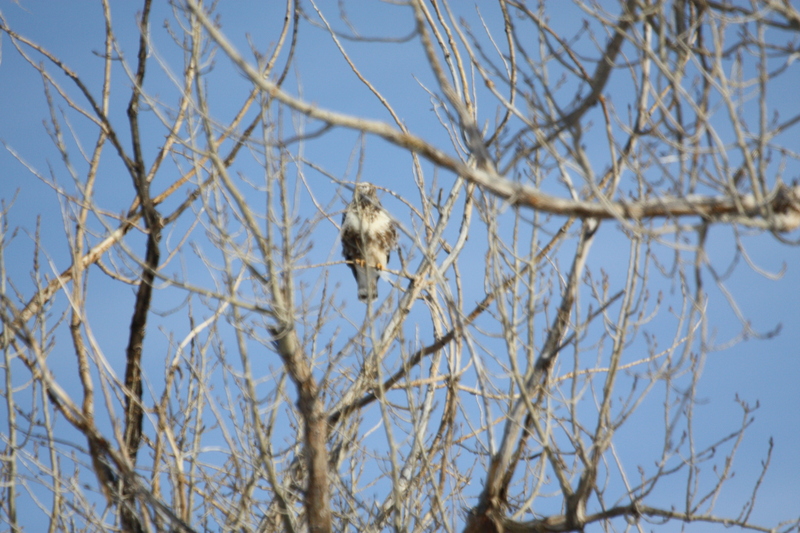 Rough legged hawk . . . . This big hawk lives in open country. He is larger than most other hawks in the area, with somewhat longer wings and a white tail with black band toward the tip. “Where’s lunch?” . . . .
High ridge lines are a good vantage point to watch the prairie for movement of rabbits, voles or prairie dogs. We studied this eagle for awhile and decided he was probably a golden, but it was at too great a distance to be certain. 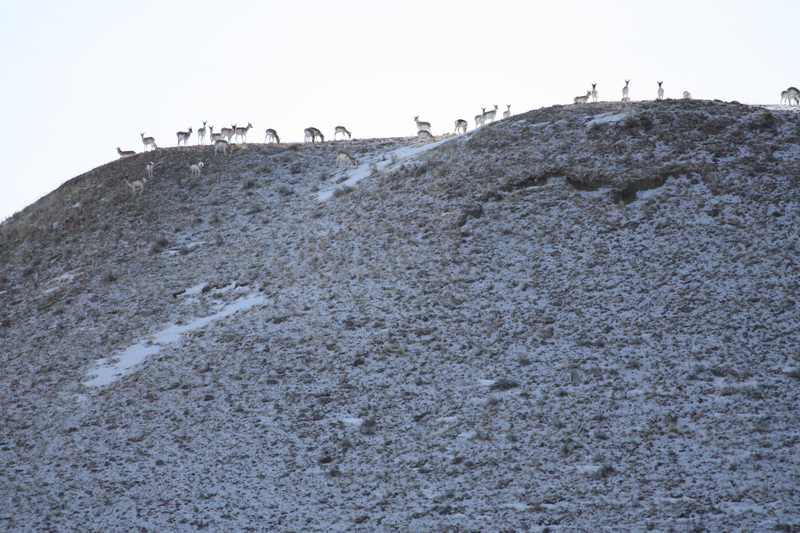 The breakfast club . . . .
Antelope grazing on a windswept hill, as forage is easier to obtain where the wind blows the snow away. They seem to be enjoying the early morning sunshine too. 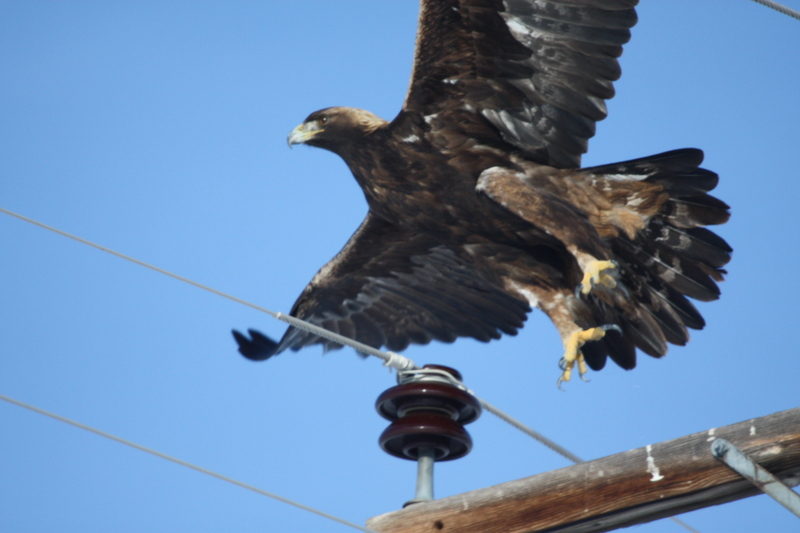 This entry was posted in Wildlife blog and tagged Bald and Golden Eagles by bygeorge. Bookmark the permalink.